The longest total lunar eclipse of the 21st century took place yesterday Friday, July 27, 2018. The total phase of the Blood Moon eclipse lasted 1 hour 43 minutes, during which Earth's satellite the Moon, turns into a spectacular red to ruddy-brown color. From start to finish, the entire celestial event lasted nearly 4 hours. This event corresponds with something even more spectacular in the celestial world. Mars on this day shines its brightest as seen from the Earth. The unusual brightness was because Mars was on this day closest to planet Earth since 2003. You can follow FUL weather updates for more information on the journey of Mars as it traverses the sky in close proximity to Earth until July 31. What is the Blood Moon Eclipse? Lunar eclipses are unlike solar eclipses where it is unsafe to look at using the naked eye. It is safe to look at lunar eclipse directly with the naked eye. The Blood Moon Eclipse is a form of lunar eclipse. Instead of going completely dark, the moon turns red or reddish brown in a Blood Moon eclipse. This is because some of the sunlight going through Earth's atmosphere is bent around the edge of our planet and falls onto the moon's surface. Shorter-wavelength light which may appear in colors such as green or blue is also scattered in the air, leaving the longer wavelength redder end of the spectrum. 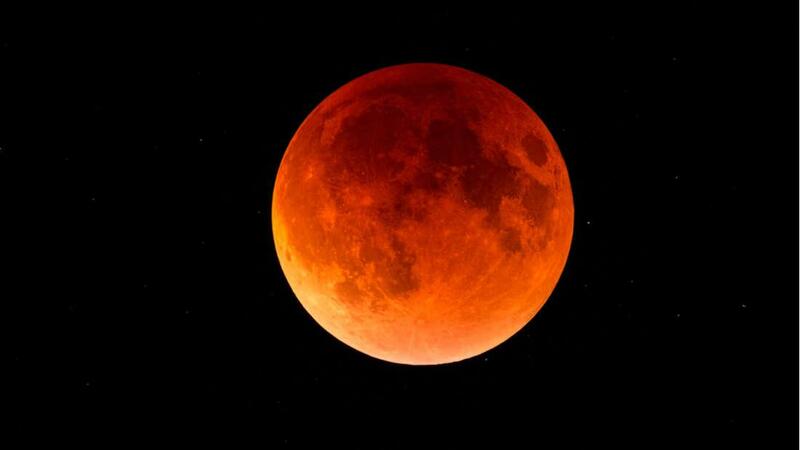 This is what gives the moon the reddish color during the Blood Moon eclipse, hence the name. Why is it the July 27, 2018 Blood Moon eclipse longest of the century? "What controls the duration of the lunar eclipse is the position of the moon as it passes through the Earth's shadow," The darkest part of Earth's shadow is called the umbra. You can picture the umbra as a cone extending from Earth in the opposite direction to the sun. "The moon can either graze through the cone, or go right through the middle of the eclipse that gets a longer-duration eclipse, this time, the moon is passing closer to the center of that cone, and it's therefore a little bit longer than other occurrences. Additionally, the moon will be at a farther point from Earth along its orbit. That means the moon will appear slightly smaller in the sky and will take a little bit longer to go through Earth's shadow. When are we expecting the next lunar eclipse? The next total lunar eclipse will occur on January 21, 2019, and will be visible in parts of Africa, Nigeria included, Asia and North America. Totality on that day is most probably going to last 1 hour and a few minutes. Follow us on Federal University Lokoja for updates on meteorology and climate change events. Department of Geography, Federal University, Lokoja.